I’m Eik Jagemann. 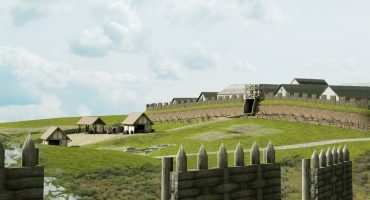 I work as a 3D generalist for Formwerk 3D and also as a freelancer in archaeological projects. I started using 3D programs for reconstructions in 2005 and wrote my bachelor thesis about the possibilities and dangers of visual reconstructions. In 2015 I finished my Masters degree at the Freie Universität Berlin with a short introduction into the 3D documentation of archaeological artefacts using low cost photogrammetry. After 10 years of archaeological drawing and excavations I started working at Formwerk 3D, a small 3D Scanning and printing office in Hannover. When I started my work there the focus of Formwerk 3D was mainly printing 3D miniatures of scanned people and the occasional prototype, but shifted over time to more scanning of museum artifacts and other archaeological objects. Now we focus on 3D Scans of historical objects for archiving, sharing, and analytical purposes and we work for several museums as well as private collectors. We also provide training for organizations to use the resulting 3D models for further research, sharing, and long time storage. I’m also working as a freelancer in archaeological projects and write about some of them in my own small blog. Generally we are scanning everything our customers want, like this teddy bear that was in the client’s family for 3 generations and will be commemorated as a small full color 3D print. Or a small zucchini derived from the original historic seeds, the 3D print of which would be used as a prop for an exhibition about traditional and historical fruits and legumes. A full color 3D print of fruits or vegetables is the ideal piece for an exhibition; it is fast to produce, can be scaled as you like, and can be shared online via services like Sketchfab to reach a wider audience long after the original exhibition closed. Also it don’t start to rot. In 2016 we had the honor of scanning the bust of Akhenaten (Amenhotep IV) at the Kestner Museum Hannover. The original is kept safe behind thick glass and is only moved every ten or 15 years. We used 3D photogrammetry from ca. 800 pictures to get a high resolution model and scaled it to real world proportions through a second structured light reference scan. We also created a set of RTI images for analysing even the smallest traces of remaining paint and traces of the artisan’s work on the surface of the model. We scanned the object in the museum with the supervision of the head egyptologist and were allowed to present the model online. This is the only model that makes its possible to look at the crown and head separated from one another and to view the mechanics of old Egyptian composite statues. 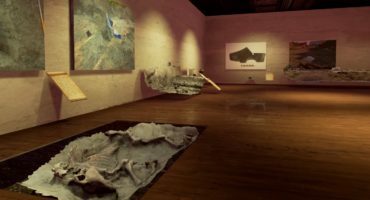 In the beginning, the museum was skeptical about presenting the object online but after some time the model was made available for everyone to enjoy on Sketchfab. Other egyptologists from North America and all over the world got in touch with the museum and they started new collaborations with each other. So the scan was a total success for everyone. We have many more projects like these in our portfolio and will update our website frequently. Scanning using photographs is, in my opinion, the best way to preserve a whole lot more information about objects and excavations while they are being investigated. For example, it is common to clean an excavation trench before taking the pictures to document it. So it is easy to take more than the normal number of photos from a few more views in order to be able to reconstruct this slice of time in an excavation. Recording in this way is imperative because after you have drawn and documented the actual trench it gets destroyed and will never be visible again. The simple task of taking more than the required pictures sets you back a couple of minutes but preserves this timeframe for ever. And you can go back and investigate your trench and features again and again. I published many trenches like these on my blog and it is interesting to see how positively people respond to these reconstructions. We also print duplicates of archaeological objects if the need arises. In 2014 an immense Bronze Age copper hoard was uncovered during the construction of a building in Erding, a small city in southern Germany. The early Bronze Age depot contained 796 copper ingots (Stangenbarren) in the form of bent rods, as well as some pottery and botanical traces. Ingots like these were used in trade and represent an astonishing amount of wealth that was buried 3000 years ago. 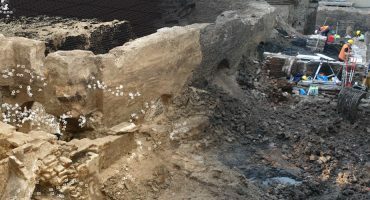 Because of the complexity and rarity of this find, the excavators decided to retrieve the whole hoard in two massive blocks for further excavation in a laboratory. There the finds could be documented with patience and without obstructing the building process any further. I was contacted because the researchers in Bavaria needed a 3D model of every stage of the excavation to get a virtual copy of this process. Archaeology is a very destructive science; everything you are researching and uncovering gets destroyed in the process. So it’s imperative to document as much as you can while digging. We agreed to produce a 3D model using photogrammetry every time a new layer was uncovered. Because it is already important to take photographs and drawings every time you establish a new stratum, it is easy to fit in a a couple of hundred more pictures to get the 3D model. The pictures were taken by the excavators in southern Germany and processed overnight by me in northern Germany to get a high resolution model. So they did not have to wait for me and got fast results. After a year of work we established a collection of 3D strata, models and point clouds, and my work was done…until the museum contacted us again. Because of the rarity of a find like this the museum planned a new exhibition with these objects as the main attraction. Now the idea was to replicate the last stage of excavation of the smaller block, as a 3D printed copy to show the people how archaeologists work and to let them touch some objects. The last 3D model was optimized and cleaned of everything artificial like the plastic hull containing the sandblock, and the metal plate. Only the original, relevant archaeological parts remained. Afterwards we separated the model into 3 different parts. The two ingot ends would be printed in plastic, as would the added connector in the middle. The preserved sandblock was printed using full color sandstone material to show the last stage of the excavation before removing the sand. Afterwards the plastic parts were painted and combined with the “sand” block to become an exact replica of the find circumstances. To better simulate the appearance of the ingots being made of copper, the plastic was painted in a fresh copper color. This printed 3D hoard and the original finds are visible in the Bavarian city of Erding. So if you are interested in the early Bronze Age you have to check out the amazing exhibition. This is not the only occasion we duplicated objects. Most of the time, the 3D printed objects are used as a stand-in if the original is going on an exhibition tour through the country or world. Replicas are used to fill the empty places vacated by the original artifacts. I think 3D scanning and reconstructing are a big chance to communicate and show people things from their own history and make them interested in viewing more. 3D models are more approachable for digital natives and incentivises them to go to the real museums. Institutions like Sketchfab are an ideal place for interested people and scientists to explore models from all around the world without needing huge travelling budgets. This approach also guarantees complete safety for the original object. It is a great way to get in touch with each other and start working together. We use Sketchfab in many more ways than the above mentioned ones and have to say it makes life easier. If you like, visit my blog or the blog of my employer for further information about our projects.